This tapestry "William Morris's Strawberry Thief" is based on one of the most loved works of William Morris. Morris found thrushes stealing fruit from his garden of his country home in Oxfordshire which was the inspiration behind this piece. The attention to detail in this piece is exquisite and one can see the thrushes among green and blue acanthus leaves, ripe strawberries and beige flowers. The acanthus leaves are further echoed on the border with exquisitely full forms of the acanthus leaves in browns and beiges, which is a signature of William Morris tapestry works. The rich blue of the central section is echoed by the more subtle blues in the border itself, to create a cohesive a rich and vibrant color palette. This design was produced by Morris with a painstaking indigo discharge technique where the indigo dyes created a blue indigo background before the printing of other colors. 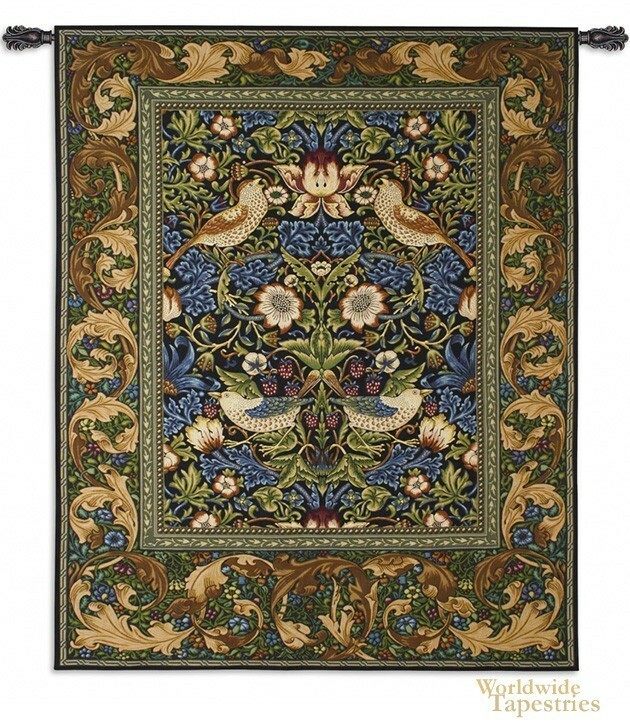 This tapestry "William Morris's Strawberry Thief" is backed with a lining and has a tunnel for easy hanging. Note: tapestry rod and tassels, where pictured, are purchased separately. Dimensions: W 53" x H 65"